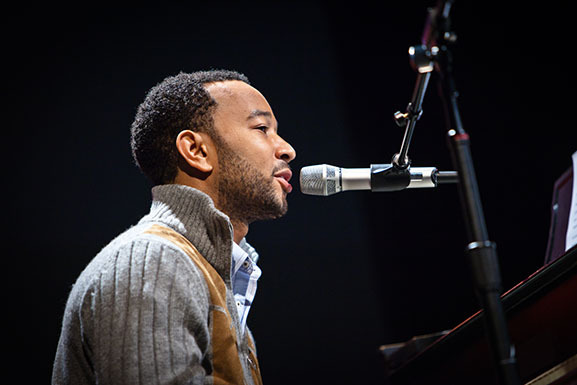 Grammy winner John Legend will be the featured guest of the Realizing the Dream series Jan. 19. From the January 2014 Desktop News | Grammy winner John Legend will be the featured guest at The University of Alabama’s annual Realizing the Dream program. He will present a lecture beginning at 7:30 p.m. Jan. 19 in the Concert Hall of Moody Music Building on the UA campus. The University of Alabama has hosted Realizing the Dream, a series of events intended to commemorate the legacy of Dr. Martin Luther King Jr., for the last 24 years. Legend is a nine-time Grammy winner, best known for his singing and songwriting. The rhythm and blues soul artist made a national splash by winning Best New R&B artist in 2006, and he has continued to gain the music industry’s top awards. He describes his style of music as all about being real. Realizing the Dream began in 1990 as a collaboration between UA, Stillman College and the Southern Christian Leadership Conference, and it is sponsored by those entities, the Realizing the Dream Committee, Shelton State Community College, UA’s University Programs and its School of Music. Actor James Earl Jones was the inaugural guest. Others who have appeared in the series include Maya Angelou, Harry Belafonte, and Sidney Poitier. Tickets for the concert are $15 general admission and are available by calling 205-348-7111 or visit www.uamusic.tix.com.